These pages are dedicated to my grandfather Henry Reed. Henry was an old-time fiddler who lived in Southwest Virginia. I'm the first to admit that I do not have a great deal of knowledge about old-time music nor fiddle playing. My goal is to present some information that will hopefully let you learn a little bit about my grandfather (rather than details about his fiddle playing). These pages have not had many updates recently, I plan to revamp the whole site in 2018. If you're looking for the Henry Reed recordings, they are at the Fiddle Tunes of the Old Frontier: The Henry Reed Collection. Info on the Henry Reed Memorial Fiddlers Convention is available at the festival Facebook page and the WNRV festival page. The Sixteenth Annual Henry Reed Memorial Fiddlers Convention will be held on June 8-90, 2018 on the grounds of the Newport Community Center in Newport, VA. Info is available on the festival Facebook page and the WNRV festival page. WNRV AM 990 will be on-site recording all the great music. The Fifteenth Annual Henry Reed Memorial Fiddlers Convention was held on June 9-10, 2017 at the Newport Community Center in Newport, VA. Info is available on the festival Facebook page and the WNRV festival page. WNRV AM 990 will be on-site recording all the great music. The Reed Family was so saddened to hear of the passing of our dear friend Alan Jabbour on Jan 13, 2017. The world is now a much lesser place. The Fourteenth Annual Henry Reed Memorial Fiddlers Convention was held on June 10-11, 2016 on the grounds of the Newport Recreation Center in Newport, VA. Info is available here and here. WNRV AM 990 was on-site broadcasting live again this year. 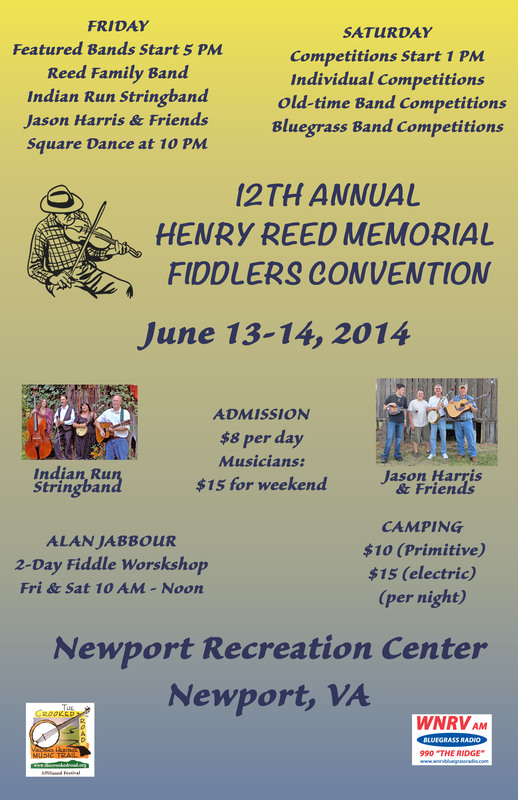 The Thirteenth Annual Henry Reed Memorial Fiddlers Convention was held on June 12-13, 2015 at the Newport Recreation Center in Newport, VA. Info is available here and here. WNRV AM 990 was on-site broadcasting live again. 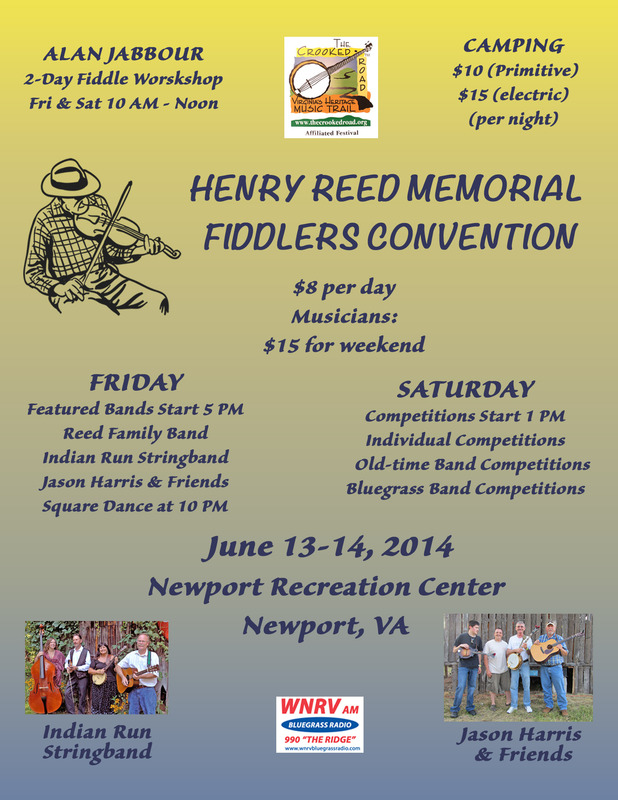 The Twelfth Annual Henry Reed Memorial Fiddlers Convention was held on June 13-14, 2014 at the Newport Recreation Center in Newport, VA. Info is available here and here. WNRV AM 990 was on-site broadcasting live again this year. Here are the flyers: 8.5x11 version and 11x17 version. The Eleventh Annual Henry Reed Memorial Fiddlers Convention was held in Glen Lyn, VA on June 14-15, 2013. Info is available here and here. WNRV AM 990 was on-site broadcasting live again this year. The Tenth Annual Henry Reed Memorial Fiddlers Convention was held in Glen Lyn, VA on June 8-9, 2012. Info is available here and here. WNRV AM 990 was on-site broadcasting live again this year. Videos for some of the featured bands and competitions are available on the WNRV YouTube channel. The video and flyer for the Tenth Annual Henry Reed Memorial Fiddlers Convention are now available at the festival Facebook page. The Henry Reed Memorial Fiddlers Convention is now an official Crooked Road Affiliated Festival, here is the press release. The Ninth Annual Henry Reed Memorial Fiddlers Convention was held in Glen Lyn, VA on June 10-11, 2011. Info is available here and here. WNRV AM 990 was on-site broadcasting live again for this year. The Eighth Annual Henry Reed Memorial Fiddlers Convention was held in Glen Lyn, VA on June 11-12, 2010. A great time was had, even with the rain. Thanks to everyone that attended! Info is available here and here (including the winners). WNRV broadcast live throughout the festival, including all the bands on Friday night and most of the competitions on Saturday. On WNRV we replayed much of the live coverage on the Mountain Music Show and New River Valley Jamboree, check the Music forum for details. Dennis Welch & I are the proud owners of WNRV AM 990, a bluegrass & old-time station that has been serving Giles County for 50+ years. We have our own homespun traditional old-time show called the Mountain Music Show on Tuesdays from 2-3 PM (rebroadcast Thursday 6-7 PM). You can check out all the Mountain Music Shows in our Archive area (as well as a sampling of the live shows we've hosted in our New River Valley Jamboree show on Saturdays from 2-3 PM). The station has a 24x7 live stream where you can listen even if you're not in the area. The Seventh Annual Henry Reed Memorial Fiddlers Convention was held in Glen Lyn, VA on June 12-13, 2009. The Sixth Annual Henry Reed Memorial Fiddlers Convention was held in Glen Lyn, VA on June 13-14, 2008. The Fifth Annual Henry Reed Memorial Fiddlers Convention was held in Glen Lyn, VA on June 8-9, 2007. The Fourth Annual Henry Reed Memorial Fiddlers Convention was held in Glen Lyn, VA on June 9-10, 2006. The Third Annual Henry Reed Memorial Fiddlers Convention was held in Glen Lyn, VA on June 10-11, 2005. Here is the flyer. Alan Jabbour recently announced a new CD titled Southern Summits that he did with Ken Perlman on banjo. Details are available in this note from Alan. The Second Annual Henry Reed Memorial Fiddlers Convention was held in Glen Lyn, VA on June 11-12, 2004. The albums The Hollow Rock String Band and Sandy's Fancy have been reissued by Alan Jabbour as a double-CD set titled Hollow Rock Legacy. Details on the CD set and ordering info are available in this note from Alan. The First Annual Henry Reed Memorial Fiddlers Convention was held in Glen Lyn, VA on June 13-14, 2003. This is a fiddle convention held in honor of Henry in his hometown. There were competitions in various types of music and dance, and Alan Jabbour gave a two-day fiddle workshop. Here is the text from the convention flyer and handout. On January 24, 2002 a new CD of Henry Reed tunes was released! It's title is A Henry Reed Reunion and it features Alan Jabbour on fiddle, Bertram Levy on banjo and concertina, and Henry's son James Reed on guitar. It's available from Alan, his release announcement can be found here. In January 2001 the Henry Reed Fund for Folk Artists achieved endowed fund status at the Library of Congress! It's been approved by the Library of Congress Trust Fund Board and the Joint Committee on the Library (a Congressional committee), so it's now an official trust fund of the Library. This fund will support programs and activities directly involving and benefitting folk artists. A description of the fund can be found at the American Folklife Center Gift Funds site. In January 2001, the contributions totaled $30,000. Many thanks from the Reed Family to everyone who contributed to the fund! The site includes all the recordings along with transcriptions, fieldnotes, and more! James Henry Neel Reed was born in Peterstown, WV on April 28, 1884 (Affidavit of Birth). He was the youngest of the eight children of John Marion Reed and Sophia Catherine Underwood Reed. Henry's grandparents were Andrew and Elizabeth Reed (here is a partial list of other family members). Henry's father came from Ireland to the US around 1845 (family name was originally spelled Reid). The family was musically-inclined, his father was a musician also, mainly playing the banjo although he played a little bit of fiddle as well. Henry's uncle and brother Josh also played the fiddle. Henry married Nettie Ann Virginia Mullins on December 11, 1907 in Monroe County, WV. Nettie was born on March 15, 1888 in Ada, WV (Mercer County). Here is a picture of Henry and Nettie taken around 1930. Henry moved around to numerous places in WV and Southwest Va. during his life, but last settled in Glen Lyn, Va. In 1939, the house in Glen Lyn in which he and his family were living burned down, destroying most of the family's possessions. For the next 2 years, they did not have a permanent home, but instead lived with various neighbors. In 1941, they moved into another house in Glen Lyn, where Henry and Nettie remained until their deaths. Henry died on February 8, 1968 after having a stroke due to a blood clot in his lungs related to complications from the amputation of his foot. He is buried in Pearisburg, Va. His wife Nettie died the following year on October 20, 1969 from a stroke and was buried alongside him. There is a mistake on their gravestone: Henry's year of birth is incorrectly listed as 1883 (rather than 1884). After the deaths of Henry and Nettie, their son Watha lived at the homeplace in Glen Lyn. Watha lived in this house with his wife Pansy until his death in 1995. The house was then put up for sale and was purchased by someone outside of the Reed family in summer of 1996. Henry never really attended or participated in many music festivals or fiddlers conventions outside of the area where he lived. He would occasionally play for local dances, often with his brother Josh. In his younger days Henry was also known for his banjo playing, but stopped playing after he lost his banjo in the 1939 fire (Henry holding a banjo with Josh). Henry was sometimes accompanied by his son James on guitar when he was older. Sometimes he would run into people such as Oscar Wright while playing locally. Outside of the Reed family, Alan Jabbour is the foremost authority on Henry Reed's fiddle playing. In 1966 and 1967, Alan visited with Henry at his home in Glen Lyn on multiple occasions. During most of these visits, Alan recorded Henry playing numerous tunes on the fiddle (and harmonica) as well as describing the origins of the tunes. Alan made several copies of these recordings, one of which he placed in the Library of Congress (LoC tape logs). Alan began serving as the Director of the American Folklife Center when it was created in 1976 as part of the Library of Congress. He recently stepped down as Director and plans to retire later this year. The new Director of the Folklife Center is Peggy Bulger. We are very grateful to Bill Richardson for providing us with a copy of the tapes as well as being kind enough to ask our permission before widely distributing other copies. In 1999 I finally took Alan up on his offer to let me make a copy directly from his original field recordings at the Library of Congress. **Alan also was generous enough to provide me with a copy of the notes he made while recording my grandfather (and I use his notes as the source of some of the info on this site). Bill Blevins, Philip Gura, Lani Herrmann, Alan Jabbour, David Lynch, Bill Richardson, and of course, the assorted members of the Reed family!